Rome has an extensive public transportation system consisting of the Metro (subway), bus, tram, and three suburban railway lines (FS) that move millions of passengers throughout the Italian capital each year. A convenient and relatively inexpensive way to get around, Rome's public transportation, operated by ATAC, will connect you to the Eternal City's most popular tourist attractions. Here's what you need to know about getting around Rome on public transportation. Rome's internal transportation system allows holders of tickets and passes to travel on all city transport within the time designated on the ticket purchased. The method you choose to use will depend on where you are going and your timing. For example, buses can get caught up in traffic, but the quicker-moving trams don't reach as many major tourist areas as buses do, and the three-line metro also might not be extensive enough to get you where you need to be. (Read more on the specific of each method below.) Check the ATAC site to plan your route. The Metro (Metropolitana): It consists of three lines: A (orange), B (blue) and C (yellow). Operating on 60 km (37 miles) of tracks with 73 station stops, the Metro is an efficient system of trains that travel both underground (subway) and above-ground. Termini Station is the main hub of Metro, with Lines A and B intersecting there. Commuter trains (Regional State Railways or FS): There are also three commuter train lines: Roma-Lido (to Ostia), Roma-Giardinetti (a narrow gauge, on-street railway), and Roma-Nord (to outlying suburbs). Commuter lines honor Metro/bus/tram tickets, as long as you are traveling within the city limits. Buses: Slow-moving but frequent buses ply most major thoroughfares in Rome and connect the areas that Metro doesn't reach. To determine which bus stops where, look at the tall signs at the bus stops on the sidewalk, and find the bus line(s) that stops at or near where you need to go. Increasingly, digital signs list the series of buses scheduled to arrive at a stop, so you'll know how long you need to wait for your bus. The biggest bus depots in central Rome and the ones you're most likely to rely on for sightseeing are located at Piazza Venezia (with most stops to the right of the Vittoriano monument), in front of Termini Station. Most buses bound for Vatican City stop at Borgo/Piazza Pia (at Castel Sant'Angelo) or at Piazza del Risorgimento, in front of the Vatican Museums. 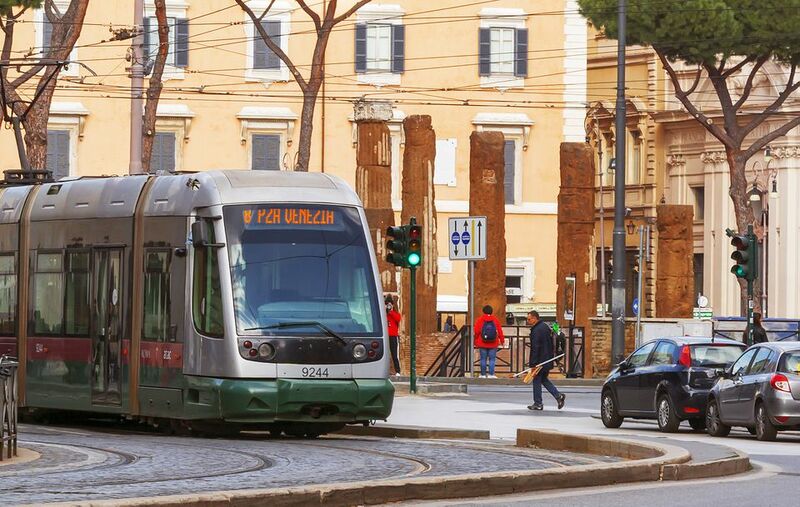 Trams: Six tram lines run across Rome, and they have a certain old-school charm. Tram stops are usually on raised platforms in the middle of busy streets, so be sure to use marked pedestrian crosswalks to get to or from these platforms. They're a bit nicer and cleaner than buses, however, these do not take you to the city center, and do not run near any major tourist attractions, so they're not your best bet for sightseeing. Despite being overcrowded and chronically behind schedule, for the most part, Rome's buses, trams, and commuter trains are reliable and highly efficient. How to Buy: In Rome, you must have a ticket before boarding any public transportation. There are several places where you can buy B.I.T. tickets (biglietti), including kiosks at stations, in coffee bars, at tabacchi (tobacco shops) and newsstands (edicole). You can also buy regional and intercity train tickets online at TrenItalia and Italo, and bus/tram/commuter rail tickets via MyCicero app. Purchases by credit card can be made at automated ticket machines or online, but when buying a single ticket, cash is required. How to Use: On the Metro, the ticket is inserted into automated ticket barriers when entering and exiting. On buses, trams and commuter rail passengers must validate their ticket in one of the yellow ticket machines inside the vehicle. Before getting on a train, you'll find green validation machines near track entrances. Most operators today accept contactless payments on smartphones, so in this case, there's no need to validate. But failure to stamp your paper ticket can result in fines of €55 and up. Fares: Rides on all public transportation in Rome cost €1.50. Children 10 and under ride for free when accompanied by an adult. Discount Fares: Discounted public transport passes are recommended for visitors, providing a better value than paying as you go. Purchase passes at vending machines in any metro station, tobacco shop, or newsstand. There's a way to buy tickets by SMS (text sent to your smartphone), but unless you have an Italian phone number, we don't recommend this option. Roma 24H (1-day) costs €7; Roma 48H (2-day) is €12.50; and Roma 72H (3-day) goes for €18. There's also a weekly ticket (CIS) for €24 (good for 7 calendar days). Hours: Buses, trams, and commuter trains operate daily from 5:30 a.m. to midnight, with limited night bus service available. The Metro is open from 5:30 a.m. to 11:30 p.m., Monday through Friday and Sunday (until 1:30 AM on Saturdays). Key Routes: Some key bus routes for tourist: 40 (St Peter's), 60 (Colosseum), 62 (Spanish Steps), 64 (Vatican), 81 (Circus Maximus), H and Tram 8 (Trastevere). Service Alerts: Like any big city, service interruptions happen. In Italy, it's quite possible to experience a general or transportation strike (sciopero) during your stay. To get updated news about impending disruptions go to MIT.gov. Transfers: Tickets on the Metro and FS trains are only good for a single ride, however buses and trams let you transfer as many times as you want in a 100-minute period. Most of the main tourist attractions are located in the historic center, but several important sights like papal palaces, gardens, catacombs, parks, and lakes are farther afield. Many can be reached by taking a combination of the Metro and/or bus, but others are harder to get to. Here are a few alternative transits options you should know about. For those who are looking for a fun and easy way to get around Rome, Scooterino is an app that sends a driver and an extra helmet to pick you up—just hop on the back and they'll take you where you want to go. There are also several companies in the city that offer electric bikes, electric scooters, gas-powered scooters and vintage Vespas for hire, too. If you are renting a motorized scooter (motorino) to pilot yourself, you must have a valid drivers license (no special license is required for up to 125cc). Given Rome's hectic and often fast-moving traffic and fearless drivers, we recommend you have solid experience operating a motorcycle. Note: wearing a helmet is required by law. You can rent human-powered road bikes, mountain bikes, trekking bikes, E-bikes, speed bikes, and tandem bikes. Consider joining a bike tour to get the most out of the experience. Go to one of the designated taxi stands scattered throughout the city. You'll find ranks outside stations, at large piazzas, and around popular tourist sights. Order a cab by phone directly from the taxi company. Arrange a pickup with MyTaxi app. It works a lot like Uber in that you put in a request and your location and it sends the nearest taxi to pick you up. Taxis rates are as follows: €2.80 (per km) from 7 a.m. to 10 p.m. On Sundays and public holidays: €4. At night between 10 p.m. and 5:30 a.m., €5.80. If you're leaving from Termini train station, there's a €2 surcharge, plus a €1 charge per piece of luggage that has to go in the trunk. Fares begin when you get in or at the time you call for one (not when it arrives). In Rome, Uber is only permitted to operate its UberX and UberPOOL (van) service. Drivers are required to have a town car NCC license, making it significantly more expensive than using taxis. Unless you are planning to drive from Rome to other destinations not connected by the national rail system, we recommend you avoid driving in Rome. Not only is it expensive (gas costs as much as 2€ per liter, equaling about $8 per gallon), but street parking is scarce, the city is full of poorly marked, one-way streets, and traffic fines can be steep. To rent a car in Italy you must be over 21 years old and have held a driver's license for at least a year. If visiting from outside the EU, you may be required to have an International Driving Permit (IDP), which you must apply for before leaving home. Check with your local automobile association for details. There are two airports that serve Rome's metropolitan area and the surrounding regions of Lazio, Umbria, and Tuscany. Fiumicino Airport (FCO), also known as Leonardo da Vinci Airport, is a large, international hub served by long-haul flights. The second is Ciampino Airport (CIO), which is served mostly by budget airlines that fly to and from cities across Italy and Europe. Airport transfers by train and bus take travelers to one of Rome's two main railway stations: Roma Termini (in the historic center) and Roma Tiburtina (just outside the walls). Both train stations have transit areas connecting to key destinations in Rome. Fiumicino Airport: Located 31 km (22 miles) from the center of Rome, the easiest and quickest way to get to the main train station, Roma Termini, is by taking the Leonardo Express, a direct shuttle train. Departing from the airport's railway station every 20 minutes or so, the train costs €14 one way. A number of bus operators provide an economical option into the city with fares around €6-7 for the 45-minute journey. If you prefer to take a taxi, they charge a flat rate of €48 (to anywhere inside the Aurelian walls) but may add luggage and extra passenger surcharges. Ciampino Airport: This airport, 15 km (9 miles) from Rome's city center, offers several city transfer options, however, there's no direct train service. Airport buses are operated by Cotral, Terravision, Roma Airport Bus, and Sit, with rides costing between €6 and €7. The journey takes about 30-40 minutes, depending on traffic. The flat-rate taxi fare (anywhere within the Aurelian walls) is €30, which doesn't include baggage and extra passenger fees. Metro Line A has the most services for disabled riders, with 39 trains providing facilities for wheelchairs, along with loudspeaker stop alarms and automatic door opening systems. Many stops are equipped with lifts and/or adaptions for the visually impaired. There are buses for disabled passengers circulating on all the main urban lines, however at present, not all stops are accessible due to curb height issues. Tram Line 8 (Casaletto - Torre Argentina) is fully accessible. For more information go to ATAC's website. Be wary of pickpockets on crowded subway cars and buses. Take advantage of navigation apps like Google maps and Mouversi. Never accept a ride from a driver not in a licensed, white taxi. Rome is a very walkable city with key attractions reachable on foot.